Our team, the Industrial Technology and Science group in IBM Research-Brazil, is focused on the building, application, and adoption of nanomaterials (which are one millionth of a millimeter in size) for large-scale industrial applications. Until about 30 years ago, it wasn't possible to see and manipulate single atoms and molecules. With the development of new techniques, we can start to experiment and theorize about the impact of a material's behavior at the nanoscale. In our new paper, "Graphene-enabled and directed nanomaterial placement from solution for large-scale device integration", published in Nature Communications, we and our academic collaboration partners proved for the first time that is possible to electrify graphene so that it deposits material at any desired location at a solid surface with an almost-perfect turnout of 97%. 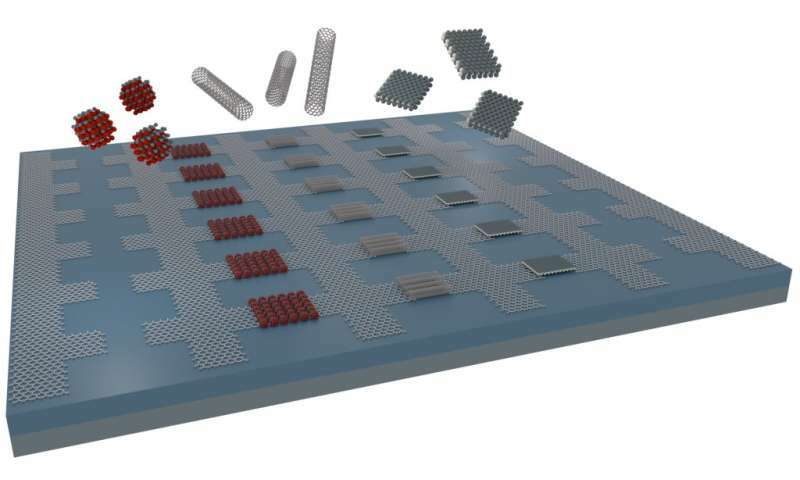 Using graphene in this way enables the integration of nanomaterials at wafer scale and with nanometer precision. Not only is it possible to deposit material at a specific, nanoscale location, we also reported that this can be done in parallel, at multiple deposition sites, meaning it's possible to integrate nanomaterials at mass scale. Graphene is the thinnest material capable of conducting electricity and propagating electric fields. The electric fields are what we use to place nanomaterials on a graphene sheet: the shape and pattern of the graphene (which we design) determines where the nanomaterials are placed. This offers an unprecedented level of precision for building nanomaterials. Today, this approach is done using standard materials, mostly metals such as copper. But the challenge occurs because it is nearly impossible to remove the copper from the nanomaterials once it's been assembled, without impacting the performance or destroying the nanomaterial completely. Graphene not only gives us precision in placement of nanomaterials, but is easily removable from the assembled nanomaterial. Importantly, the method works regardless of the nanomaterial's shape, for example, with quantum dots, nanotubes, and two-dimensional nanosheets. We have used the method to build functioning transistors and to test their performance. In addition to integrated electronics, the method may be utilized for particle manipulation and trapping in lab-on-chip (microfluidics) technology [US20170292934A1]. Evidence such as this published research suggests that graphene could enable the integration of nanomaterials that standard materials (used today) are not able to do. This could pave the way for its inclusion into industrial-scale electronics manufacturing, which is a key objective of one of the most ambitious research efforts globally, Graphene Flagship. By working with industrial partners, we hope to accelerate the knowledge generation, technology development and adoption of this bottom-up method for integration of nanomaterials.